The Book ”BACK WHEN” was written by Kyle Baker who grew up in Union, West Virginia, Monroe County. He graduated from Union High School in 1958, went on to college at Potomac State for one year and then on to Concord University to graduate in 1962. He came back to Monroe County and worked numerous jobs in education including Assistant Principal for one year at Union High School and as a Coach and also Principal for the year of 1970. 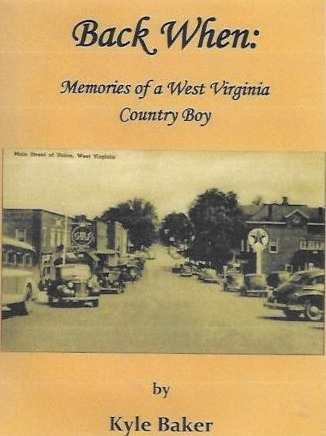 The book “Back When”: Memories of a WV Country Boy, is a book starting with how the author’s first memories of Union where he grew up and comes forward to his present life. Stories of people you will recognize and oodles of pictures are included. The book will hopefully stimulate your own memories of the people you have interacted with in your life.